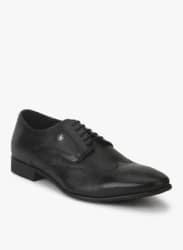 Make the girls go gaga about your fashion sense with this ultimate pair of black coloured formal shoes from the house of Hush Puppies. The casual lifestyle footwear from Hush Puppies is designed keeping in mind the style conscious youth. These fabulous formal shoes can be teamed with your outfit for a cool look.